Everyone knows that a healthy diet is essential for a healthy body. What many people don’t realize however is that, as you age, your dietary needs change. Researchers at Tufts University have developed the MyPlate formula, an upgrade on the old food pyramid, which provides updated and improved nutrition advice for people age 65 and over. 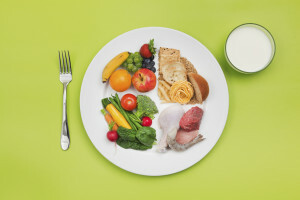 The MyPlate for Older Adults model emphasizes the importance of foods that are high in vitamins and minerals and low in fat, salt and sugar; however, it also includes guidance regarding recommended regular physical activities and fluid intake, components that are of particular concern for older adults. Physical activity, such as walking, resistance training, and light cleaning. Additionally, suggested modifications include bags of frozen pre-cut vegetables that can be resealed and single-serve portions of canned fruit – choices that can be easier to prepare and have a longer shelf life, minimizing waste. At Hired Hands Homecare, we understand how challenging it can be to help senior loved ones eat right and maintain optimal health. Our dedicated California caregivers can help plan and prepare healthy, nutritional, and delicious meals based around your loved one’s unique nutritional needs. Contact our team to learn more about our in-home care services in Marin, Sonoma, Napa and Solano counties as well as Alameda and the Tri-Valley area.